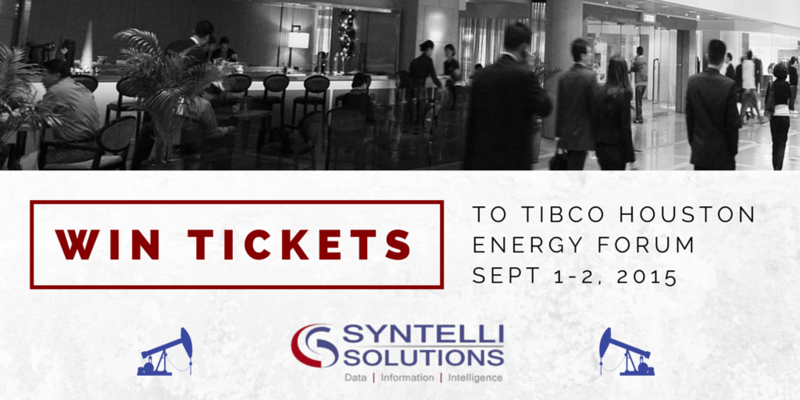 Win Tickets to TIBCO Houston Energy Forum! As you know, big data analytics is a fast-growing—some would say disruptive—practice in the oilfield. It and other developments in data analytics will be topics of discussion at an upcoming conference. Join us at the 13th Annual Energy Forum in Houston, Texas. That’s where nationally known technologists, oil and gas operators and data analytics solutions providers (we’ll be there!) will meet on September 1st and 2nd. Organized by TIBCO, the summit hosts participants will present the latest innovations, trends, and analytics technologies that are transforming business operations throughout the energy sector. How to minimize risks by better understanding exposure to asset integrity issues. Using forensics methods to reduce NPT and monitor production levels. Using analytics to control margins and conduct customer profiling. Best part: we’re so excited to attend that we’re giving away 2 tickets* to the conference! Enter by August 15th, 2015, midnight for a chance to win! See you at the Norris Convention Center Town & Country in Houston! For more information about the conference, check out the TIBCO Energy Forum event website. And, you can find more information about Syntelli here. *Contest open to everyone. Winning entries will receive attending tickets only (granting entrance to the Norris Convention Center Town & Country in Houston). Winning parties will be responsible for any other costs associated with attending (lodging, transportation, meals, etc.). TIBCO is the host of the Houston Energy Forum, and is not affiliated with this giveaway.